Did you know that Carbon-14 has been found in dinosaur fossils? This is an extraordinary discovery because Carbon-14 has a half-life of only 5,730 years. As a result, any Carbon-14 in a sample should decay to undetectable levels well under 100,000 years. This means that any fossil containing Carbon-14 must be less than 100,000 years old. 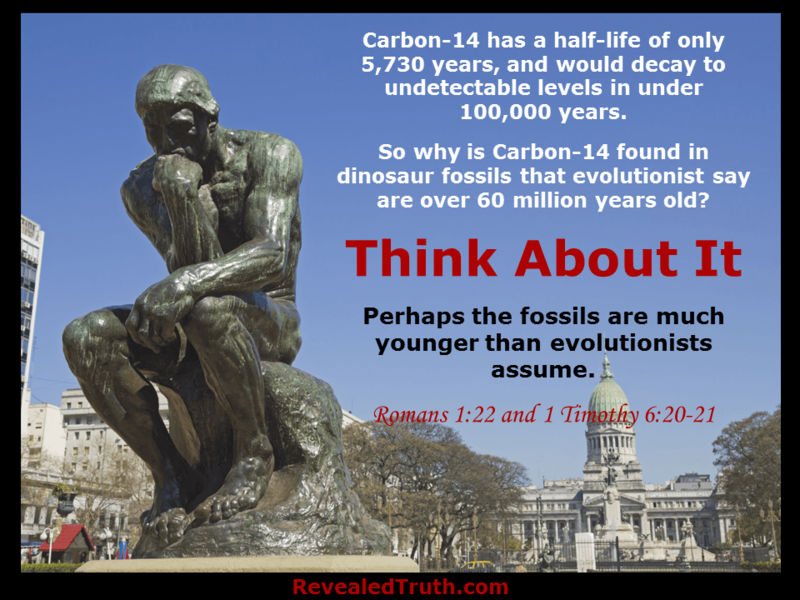 Evolutionists insist that all dinosaurs died out 60 million years ago, so it should be impossible for any dinosaur fossil to contain Carbon-14. But dinosaur fossils have been discovered with detectable radiocarbon, which proves they died only thousands of years ago, not millions of years ago. Evolutionists try rescuing devices like saying the samples were contaminated. But other dating methods used to show ages of millions and billions of years are open to the same criticism. If radiocarbon dating cannot be trusted because of potential contamination, then neither can Uranium/Lead, Rubidium/Strontium, Potassium/Argon, or any other radioactive decay dating method. Did you know that soft tissue has been found in dinosaur fossils? The many discoveries of soft tissue in dinosaur fossils are also extraordinary because soft organic tissue is fragile and decays. It may be able to survive thousands of years (i.e. : since the flood in the days of Noah), but it could not survive for over 60-million years. Did you know that ancient petroglyphs and carvings of dinosaurs predate the modern discovery of dinosaur fossils? The first known dinosaur fossils were discovered before the term “dinosaur” existed. Paleontologist Sir Richard Owen coined the taxon name “Dinosauria” (meaning great/terrible lizard/reptile) in 1842. Since the discovery and naming of dinosaurs is relatively recent, and evolutionists believe they all went extinct over 60-million years ago, ancient people should have had no knowledge of them. Yet the description of “Behemoth” in the Biblical book of Job provides an excellent description of an Apatosaurus (Job 40:15-24). Cultures from around the world had legends of “dragons,” which some people believe to just be the name ancient people used for what we now call dinosaurs. And many ancient petroglyphs and carvings of what look remarkably like dinosaurs have been found in diverse parts of the world. This provides evidence that people who lived only thousands of years ago lived with dinosaurs, which means they did not die off over 60-million years ago. The Old Testament law stated that legal matters would be established at the mouth of two or three witnesses (Deut. 17:6; 19:15). Paul quoted this law, saying “In the mouth of two or three witnesses shall every word be established” (2 Cor. 13:1). Jesus also referred to this principle in Matthew 18:16. This article has provided the testimony of three witnesses to establish that dinosaurs lived and went extinct only thousands of years ago; not millions. The 3 witnesses are Carbon-14 found in Dinosaur fossils, Soft Tissue found in Dinosaur fossils, and Dinosaur descriptions and depictions that are only thousands of years old. 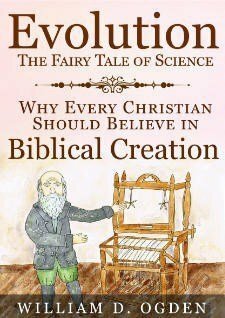 It is time to stop bowing down to faith in unproven evolutionary theories. Dare to Believe the Bible! 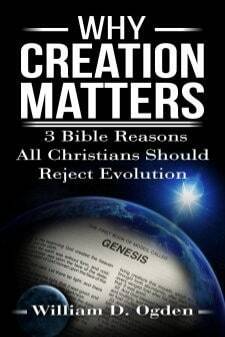 1 Peter 3:15 – Are You Ready to Answer Evolutionists? Previous Post Noah’s Sons – Was Shem the Oldest? Next Post Are You a Syncretist?